Make it a two week adventure and hike over the border to France for another great week of hiking! Spaniards have been keeping on of the most spectacular national parks a secret for almost a century. The Parque Nacional de Ordesa y Monte Perido, nestled in the central border between Spain and France is claimed to be the Yosemite of the Pyrenees. With steep canyon cliffs leading into the lush green Valley of Ordesa, the park has a monopoly on one of the most unique geological and ecological landscapes in all of Europe. Monte Perdido, Lost Mountain, towers over the landscape at the terminus of the Cirque de Soaso at the end of the Valley of Ordesa. The valley is home to an incredible diversity of ecosystems and landscapes. Walk through pine forests that turn to alpine meadows; another bend in the trail leads to a birch stand and around the corner a carpet of mountain laurel. The abundant wildlife and fantastic flora offer rare glimpses of ibex and chamois as well as the elusive edelweiss. Ridge walks offer unforgettable views down the valley and to the highest peaks in the Pyrenees. 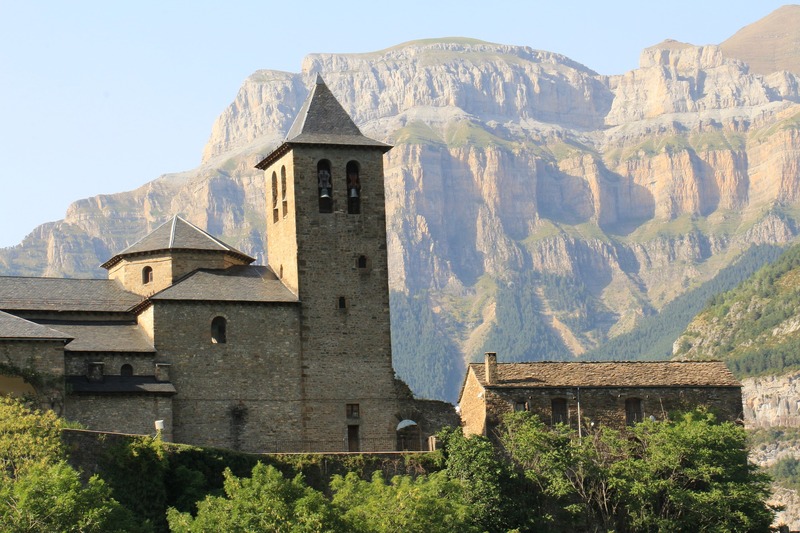 Tucked amid the highest peaks of the Pyrenees, the tiny village of Torla, having less than 200 inhabitants, is lost in time. Be immersed in the Spain of old, sampling the local specialties of jamon and queso viejo. The stone buildings, most built before 1600, small cobblestone streets and untouched charm of this former farming town has been plucked from a storybook. The GR-10 (Grande Randonnee 10) is the most popular route across the Pyrenees. It runs on the French side of the border. Of the three main trans-Pyrenees routes, the GR-10 is the best-blazed and the easiest to follow. However, while easiest logistically, it is physically difficult because the trail the French side of the Pyrenees gets much more rain than the Spanish side, so the weather is more challenging. Also, the GR-10 is more demanding than the 2 others because of the long and steep descents and ascents into and out of the many precipitous north-south running valleys on the French side of the mountains. However, the GR-10 does offer the possibility of sleeping in a town or a refuge every night, reducing or eliminating the need to carry camping gear. The GR-11 (Grande Randonnee 11) follows the French system of blazing and numbering, but it runs through the Spanish Pyrenees, on the south side of the border. 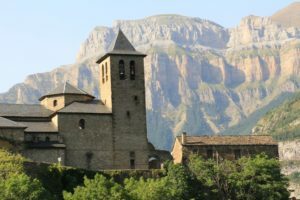 The route is not thoroughly blazed, and can sometimes be difficult to follow, but it is extremely beautiful, and can be crowded, especially in the popular Spanish national parks. While more difficult logistically, it is less physically difficult than both the High Level Route and the GR-10, although very few people hike the entire GR-11 from the Atlantic to the Mediterranean. HRP (Haute Route Pyrenean) is the High Adventure Route, which stays in the highest, most remote country as much as possible. It is usually blazed in yellow, although it sometimes follows the red-and-white blazed GR-10 or the GR-11. It goes through the middle of Andorra, the tiny country that occupies a small part of the Franc-Spanish border. When hiking in the remote central part of the Pyrenees on the HRP, hikers must carry all their camping gear, because towns and refuges are too far apart. Route finding is the major challenge, as the blazing is sporadic. In all three cases, trail quality varies. The routes include paved roads, farm-roads, footpaths, and cross-country travel (mostly on the HRP). The Pyrenees are precipitous, and many of the trails are very steep, which reduces the number of miles it is possible to hike in a day.